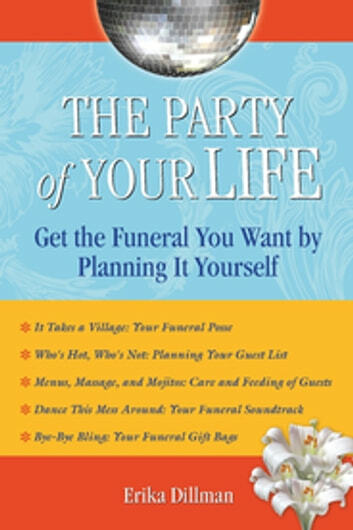 The Party of Your Life is a lively, irreverent guide to putting the F-U-N back in funeral. This upbeat book will appeal to adults of all ages who want a send-off that reflects their interests, achievements, and taste. 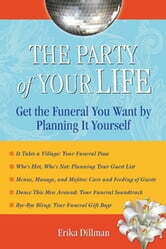 The Party of Your Life will help readers explore the full range of creative, culinary, musical, and theatrical possibilities of a well-planned (i.e., self-planned) end-of-life party. Baby Boomers, Gen-Xers, and younger generations not interested in having a traditional funeral will appreciate author Erika Dillman’s hip and humorous approach to planning your own funeral. With the help of The Party of Your Life, the newly dead will rest in peace knowing the tips in the book have helped reduce the drama and strain on their survivors, who are likely experiencing the most painful time of their lives.